"I already have about 3,000 songs purchased. I want to use some of them as ringtones on my iPhone but I don't want to buy the same song as a ringtone. How can I create iPhone ringtones from my music?" The only foolproof way to create ringtones for your iPhone is to use the method Apple permits via iTunes. Apple regularly breaks the other methods software developers and creative iPhone owners use to make their own ringtones. I did find a solution that seems to work for iPhone 4 owners, as well as iPhone 3GS and iPhone 3G, using an affordable software app. The two things that make creating custom iPhone ringtones a challenge are being able to save the files to a location iTunes will recognize and being able to add them to your iPhone. 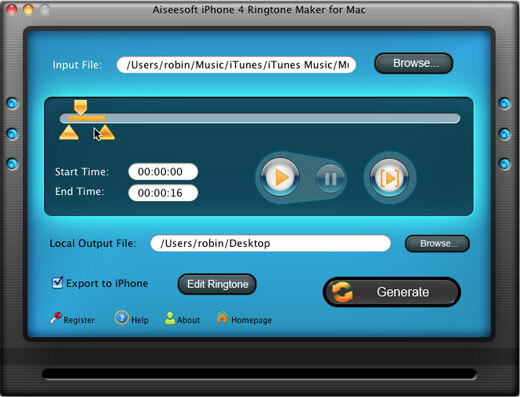 Aiseesoft iPhone Ringtone Maker accomplishes both using any song in your iTunes library, without needing to use iTunes to manage your ringtones. 1) Choose the song you want to convert to a ringtone. 2) Set the start and endpoint for your ringtone in the song. 3) With your iPhone connected to your computer, generate the ringtone and add it to your iPhone. If you ever want to change one of your ringtones, the app lets you edit the ringtone and add the change back to your iPhone. On your iPhone, the ringtones created this way will show up under a Custom option when you are choosing ringtones for specific contacts.